Reading over the summer is very important for students to retain the gains they made during the school year. 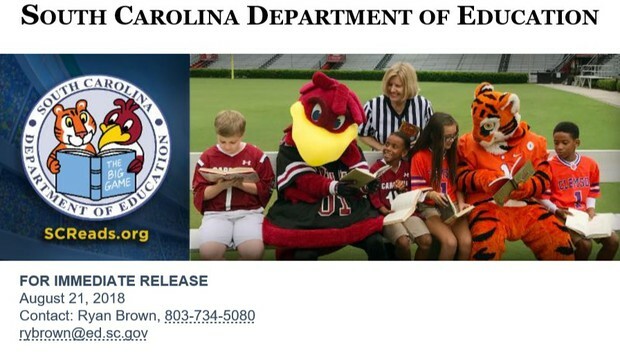 Students that complete their summer reading log will be eligible for an extra book at check-out - all year long! Don't forget to turn in your Summer Reading Log to Mrs. Smith! WELCOME BACK TO SCHOOL, PIRATES! Parents, please check here for all the up to date news and fun happenings from the PTO. Together we can make this one of the best school years for IHES and for our children. Come join us for a sweet treat this Thursday, August 23 from 3:00-7:00pm at Sweet Frog in RH. 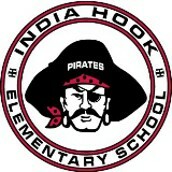 Make sure to mention India Hook Spirit Night. 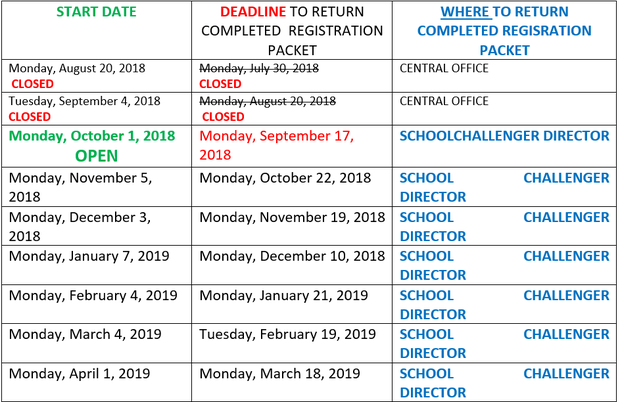 Registration for our Fall 2018 program is now Open. Don't forget to sign up for this great opportunity! The Lions Club of Tega Cay and Riverhills has partnered with Rock Hill School district to provide free vision screening to students in each of our schools. According to educational experts, 80% of learning is visual. So if a child can’t see well, he can’t learn well. The mission of the Lions Club is to ensure eye screening for all children and referral for follow-up care is given to all students in need because every child deserves to learn and see the world clearly. Eighty percent of all visual impairment can be prevented or cured. The first step to prevention is awareness. The second is early detection through vision screening. Early identification leads to timely referral, professional treatment, and improved or restored sight. The Lions Club will screen students with a screening device (similar to the appearance to a digital camera) to identify vision problems. The screener takes a reading of the student’s eye from a distance of 3-4 feet while the student looks into the screening device. No physical contact is made with the student and no eye drops or medications are used. Screening results will be given to the school nurse at your child’s school. If your child needs follow up care with an eye doctor, the school nurse will send home a referral letter and printout of the screening results. Screenings will be on September 4, 2018. If you do not wish for your student to participate in this vision screening program please contact your child’s school nurse. Boy Scout representatives will be present outside cafeteria to invite all students to scouting on the way to lunch. Monday, August 27 at 4:00 at the central office, Camp Canaan and Betsy Forrest will e recognized by our school board for their service to our school. Please join me in thanking them for their service. 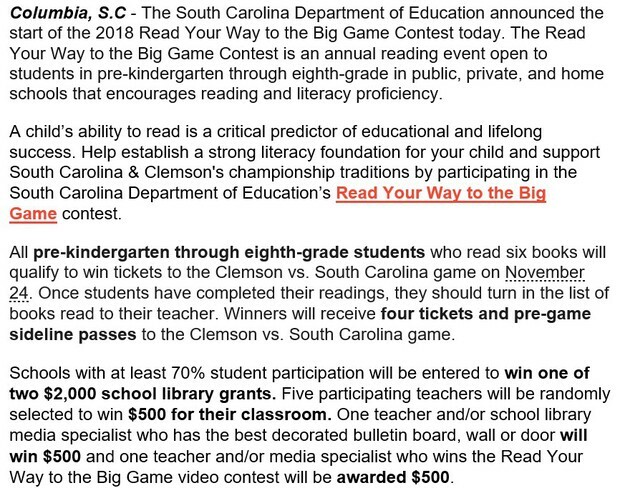 Visit SCReads.org for the full contest details! Parents may begin Friday lunch visits. We will have tables set up on kindergarten patio or in the center of the building for families to eat while they visit. Parents may also come have lunch on their child's birthday.